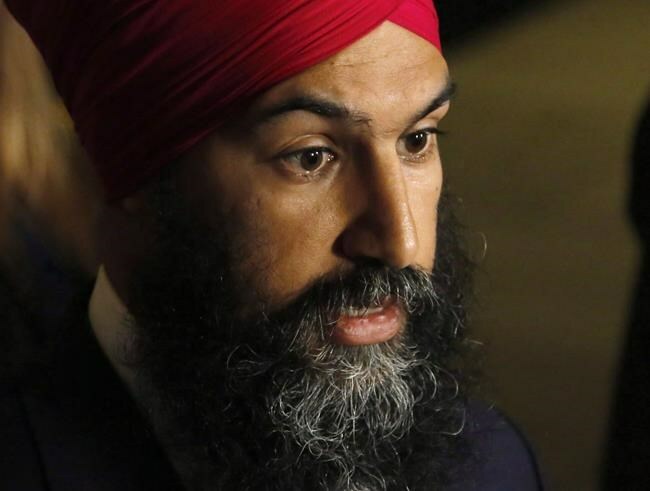 OTTAWA — Jagmeet Singh won't allow scorned MP Erin Weir to run as a New Democrat in the next election — a decision that has caused a rupture between the NDP leader and the party's long-standing members in Saskatchewan. In a letter to Weir this week, Singh says he isn't confident the Saskatchewan MP won't repeat the harassing behaviour that got him kicked out of the NDP caucus last spring. Consequently, Singh says he rejects the MP's request to be readmitted to the NDP caucus and won't approve his candidacy for the 2019 election. But 67 former New Democrat MPs and MLAs from Saskatchewan have now written to all NDP members of Parliament, accusing Singh of denying Weir due process and unfairly maligning his character, while flouting the party's constitutional rules for dealing with harassment complaints. The letter was signed by "every living former MP" from Saskatchewan, according to former provincial cabinet minister Pat Atkinson, who wrote the letter on behalf of the 67 former legislators. Weir was one of three New Democrats elected in Saskatchewan in 2015, ending a 15-year drought for the federal party in the province. Atkinson predicted Singh's unilateral decision to oust Weir will jeopardize that hard-won comeback. "I think what it means is that there'll be less people willing to donate, there'll be less people willing to step up to door knock. I think it has a very serious impact on the federal party in our province," she said in an interview. The former Saskatchewan legislators first wrote to Singh in May when he expelled Weir from caucus following an independent investigation into allegations of harassment. Atkinson said they have tried to work with the leader to remedy the situation, but "there was no listening, no accepting, he just had his mind made up, obviously." "Successful leaders listen to people in the field, they listen to former politicians, they listen to party members, they listen. You just can't have a little enclave of people," she said. In the Weir case, she added: "You sure should take into consideration what New Democrats in Saskatchewan are thinking." Weir's supporters have solicited two legal opinions, including one from former Saskatchewan justice minister Eric Cline. They argue Singh does not have the authority to unilaterally expel Weir, which is a violation of disciplinary procedures set out in the party's constitution and the anti-harassment policy adopted by New Democrats at their last convention. And they question Singh's decision to initiate an investigation in February based on hearsay from another MP, Christine Moore, before any actual complainants had come forward with specific allegations. Weir's supporters are also upset by what they consider the leader's exaggerated response to the investigation, which found one claim of harassment and three claims of sexual harassment against Weir were sustained — all of which were deemed to be "on the less serious end of the spectrum," involving the MP standing too close or failing to read non-verbal cues in social settings. It was Weir's response to the findings — publicly dismissing one complaint as payback for a policy dispute he'd had with a member of former leader Tom Mulcair's staff — that got him booted out of caucus permanently in May. In his letter to Weir, Singh said he isn't satisfied the MP has taken the actions necessary to rectify the damage he did to the NDP's "work of building a safer workplace and party." "I have not seen evidence of a genuine understanding of how your behaviour needs to change or an expression of regret and remorse for describing sustained findings of harassment as 'trumped up,'" Singh writes. "I have not seen you take responsibility publicly for very publicly harming the reputations of your former caucus colleagues nor work sincerely at repairing the trust and confidence that was broken. I am not confident that the harassing behaviour will not be repeated." Singh said his office received this week an email from the president of the union representing staffers working for New Democrat MPs expressing concern about Weir's request to be reinstated to caucus. According to Singh, the union leader said welcoming Weir back into the fold "would put staff at risk and would violate their rights under the collective agreement to a safe, healthy and harassment-free workplace." However, in her letter to MPs, Atkinson notes the president of the staffers' union happens to be Singh's press secretary.